In the last couple of weeks however, the Woodland Trust has reiterated its deep concerns relating options B and C of EBC’s Local Plan, namely the proposed development of 6,000+ new houses and a major new road at Allbrook, Bishopstoke and Fair Oak. 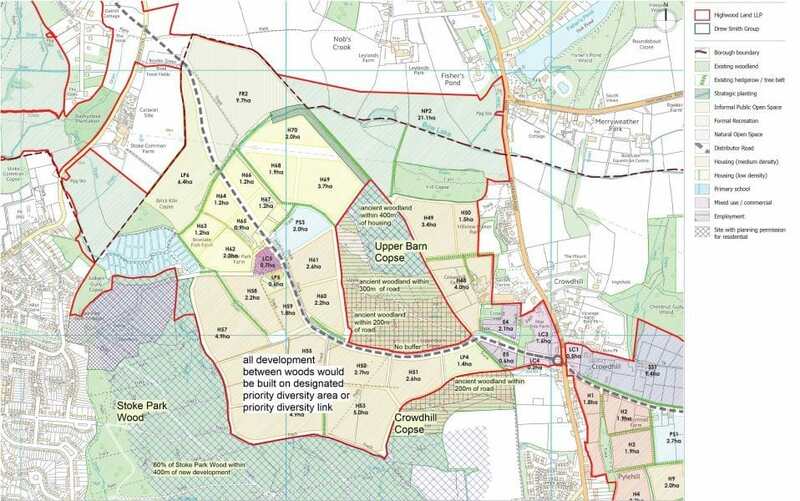 If EBC chooses these proposals, currently its favoured options, the Woodland Trust believes it will be “hugely damaging” to two of its ancient woodlands, Upper Barn Copse and Crowdhill Copse, between which its proposed new road would be built – see our annotated version of the developer’s map above. Moreover, as the map shows, the developers are saying to the council that they should “have houses between two sets of woodlands” (not only between the Upper Barn and Crowdhill copses but also between Upper Barn Copse and Stoke Park Wood, another ancient woodland owned by the Forestry Commission), so, if Keith House is true to his word, presumably he will now “turn around and say: ‘No, you can’t do that’”? (Given the woods and the fields between them are designated by the council as priority biodiversity areas/links, it seems extraordinary he hasn’t said this already – but that’s a different story). In the 2012 report, entitled ‘Impacts of nearby development on ancient woodland’, the Woodland Trust referenced the significant amount of research that has been done into the various ways in which road and housing developments can degrade, and ultimately destroy, ancient woodland. These included ‘chemical effects’ (vehicle emissions), noise, vegetation clearance, light pollution and fragmentation (see pp 6-12). The report also covered the effectiveness of ‘buffer zones’ as a means of mitigating the damage caused by development (see p.19). In this section, it detailed how 100-200 metres is necessary “to protect plant species from the effects of vehicle emissions from roads; 300 metres is necessary to “to protect woodland bird species from the effects of roads”; and 400 metres is necessary “to protect woodland bird species from the effects of urban development”. Given that the gap between Upper Barn Copse and Crowdhill Copse is approximately 175 metres, and all of the woods will be within 400 metres of the proposed development (see map), we cannot see how EBC would be able to build its proposed new road and housing without ultimately destroying the ancient woodland. Even if the road was realigned to run down the centre of the gap between the two woods, the maximum buffer possible would only be 83 metres. Martin Hawthorn, the developers’ agent, talked about the need for “substantial buffers”, but obviously there isn’t the room. Given the clear promises made by Keith House and several of his fellow councillors to protect ancient woodland, surely this makes it a showstopper? To support ADD in our campaign against options B and C, please offer your services, donate to the cause or simply join our Facebook group. To find out more about the Woodland Trust and how to save Britain’s ancient woodlands, click here.